From the early 1900’s through the 1950’s there was an explosion of activity in the United States from artists creating fine art prints. 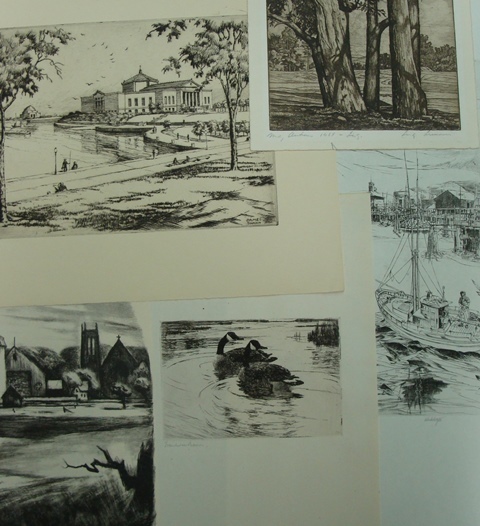 Techniques such as etching, drypoint, aquatint, stone lithography, woodcut and wood engraving were refined and perfected to create some of the best art of the 20th century. These prints are aesthetically pleasing but also give a unique perspective of the history of this era in American life. The purpose of this site is to explore the artists and their “works on paper” as well as some of the institutions they created to advance their skills, market their production and increase awareness of their art. We will cover such artists as Joseph Pennell, James Swann, Bertha Jaques, Levon West, Frank Benson, Leon Pescheret, Otis Dozier, Blanche McVeigh and John Winkler. The organizations we will focus on include the Chicago Society of Etchers, the Prairie Print Makers, the Lone Star Printmakers,the Woodcut Society and others. Hi Jim please keep me informed of exhibitions and dialogue regarding fine art prints. I will. Thanks for letting me be involved in your excellent class on making a lithograph. It was very informative and well presented. Found “In Praise of Prints.” Will follow in the future. A wonderful site on an important but neglected aspect of American art. Kudos Jim! Jim, great to see you doing this work. I’m proud of my friends when they believe in something enough to spread the word.